Spartanburg, SC — On Wednesday, October 10, at the 2018 national StriveTogether Cradle to Career Network Convening held in Seattle, Washington, Dr. Russell Booker, Superintendent of Spartanburg School District 7 and founding board member of The Spartanburg Academic Movement (SAM), was installed as the newest member of the StriveTogether Board of Directors. StriveTogether is a national nonprofit working to bring communities together around data to make decisions and improve results for kids . “Dr. Booker is a tremendous asset to Spartanburg. As a SAM Board member, he brings insight to the work from our most urban communities while adding perspective from multiple sectors due to his career-long dedication to strong community engagement. His insight has deeply impacted the success of the Spartanburg Academic Movement across our county,” said Jennifer Evins, SAM Board President. Dr. Booker was introduced as the newest board member to the StriveTogether network at the opening reception of the annual Convening, held at the Seattle Art Museum. 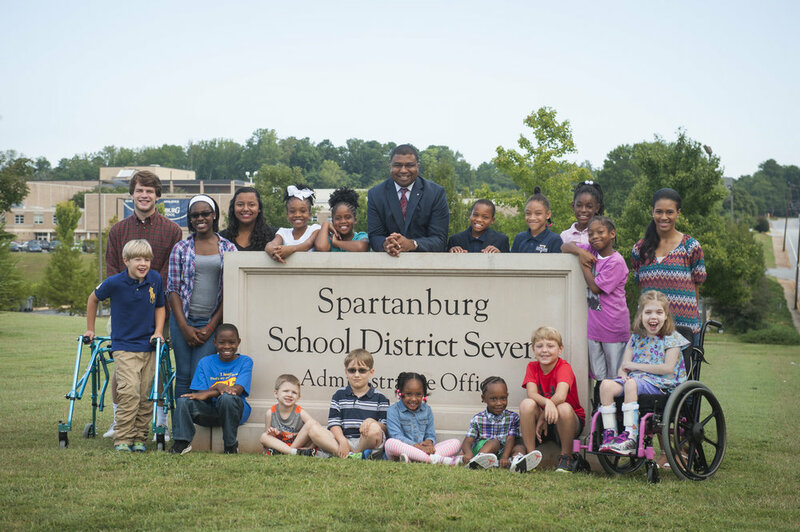 Booker and the SAM Board have challenged Spartanburg County and the Spartanburg Academic Movement to find answers for children, to close disparities in educational achievement, and make the difference in bringing equity to the forefront of community action. He has been actively engaged in StriveTogether staff site meetings in Spartanburg and other cities. “I have tremendous respect for StriveTogether and the Cradle to Career Network. Our network partners truly understand the value of collective impact – of getting key community leaders around one table to effect better results for all of our children. By deepening our relationships and sharing accountability we have a chance to make real and lasting changes to our education systems. That’s happening in Spartanburg thanks to SAM, and it’s incredibly meaningful work to be fueling the success of our children,” Booker said. Russell Booker began his tenure as Superintendent of District Seven in 2010 after serving three years as superintendent in York School District One. With an unwavering conviction in the power of education, he believes our greatest hope for the future is to inspire and equip students for meaningful lives of leadership and service. Described as an inspirational leader and a champion for children, he has directed many progressive initiatives in District 7. Most notably, he led a total restructuring of the District, a complete digital immersion, and a comprehensive capital plan that has been described as bold and transformational. He is a South Carolina Liberty Fellow (affiliate of the Aspen Global Leadership Network), a graduate of the Diversity Leaders Initiative, and the Spartanburg Regional Fellows program. He holds membership with Kappa Alpha Psi Fraternity, Inc., the Southside Lions Club, and the Downtown Rotary Club of Spartanburg. Booker serves as vice-chair of the Liberty Fellowship Board and is a past Chair of the United Way of the Piedmont. He serves on the board of the Spartanburg Academic Movement, the Northside Advisory Board, and Wingate University. In 2013, Dr. Booker received the Whitney M. Young, Jr. Humanitarian Award from the Urban League of the Upstate and in the summer of 2015 was inducted into the South Atlantic Conference (SAC) Hall of Fame as a Distinguished Alumnus. In 2015, Dr. Booker was named the South Carolina Superintendent of the Year by the South Carolina Association of School Administrators (SCASA) and was also named Superintendent of the Year by the South Carolina Athletic Administrators Association. He is a past-president of SCASA’s Superintendents’ Division. Booker received his BS degree from Wingate University and his doctorate from the University of South Carolina. Russell and his wife Sheryl are the proud parents of two sons and reside in Spartanburg.